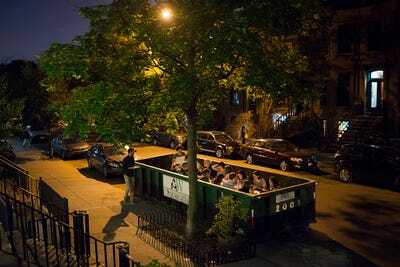 This past summer, recent School of Visual Arts grad Josh Treuhaft drew headlines for his buzzy Salvage Supperclub,which treated attendees to a gourmet dinner held in a dumpster in Brooklyn. The location was chosen to draw attention to the source of the dinner’s ingredients, food that quite literally would have otherwise ended up in the trash. In the US, 133 billion pounds of uneaten food — nearly one-third of all the food America produces — is tossed in the garbage every year. Treuhaft started his supper club not only to draw attention to this, but also to highlight the ways that regular people could take action by appreciating, and eating, the ageing food that they normally throw away. Salvage Supper, which has been held five times over the last several months, is evolving into a a full-fledged business. 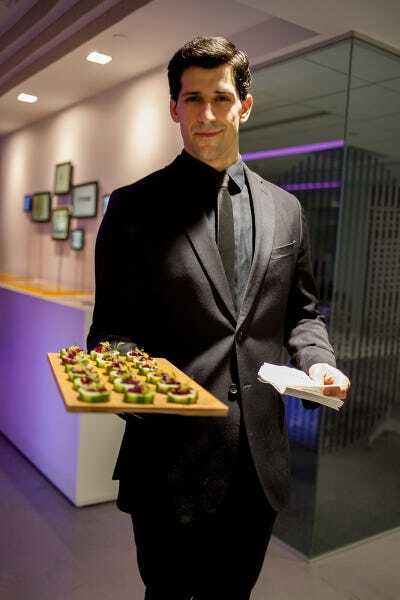 Treuhaft and his chef Celia Lam were recently contracted to cater a 300-person party for the engineering firm Arup, where Treuhaft now works. 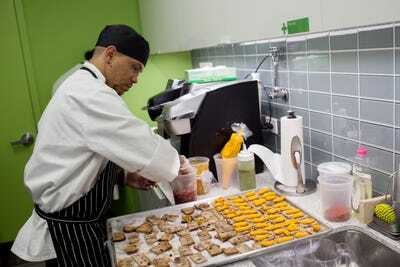 For the party, the team traded traditional hors d’oeuvres like deviled eggs and meatballs for high-class fare like beet tartare and curried squash shooters, all created from salvaged food. 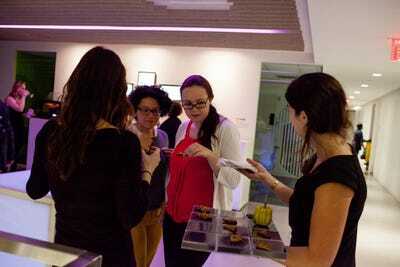 The goal: to educate party-goers about how food is being wasted, and how to save it. 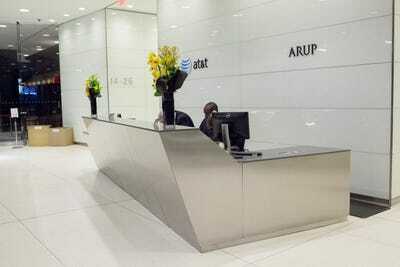 We headed down to Arup's New York headquarters on Wall Street. The company was hosting a 'REparty' to show off its various Green engineering projects to members of the company, as well as others in the industry. The party's theme fit perfectly with Josh Treuhaft and Chef Celia Lam's Salvage Supperclub, which serves salvaged food to educate people about food waste. Here's a look at the original Salvage Supper, held in a dumpster in Brooklyn. 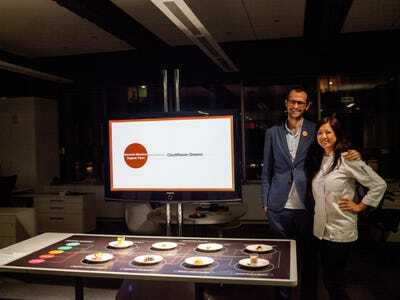 Treuhaft connected with Chef Lam after conducting his own test dinners using ingredients that his classmates were throwing out. Lam has always been a strong advocate of 'root to stalk' cooking, using every part of an ingredient. 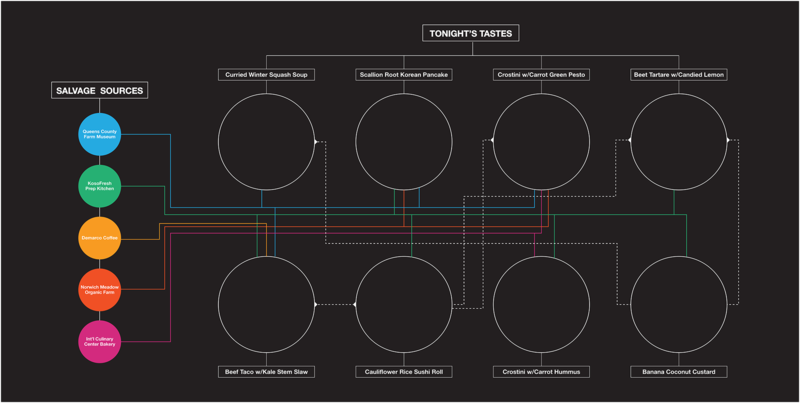 For their Arup dinner, Treuhaft and Lam created a graphic that showed where the ingredients for each dish were salvaged from. 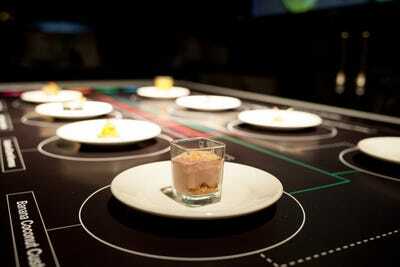 It was a logistical challenge to develop the menu. 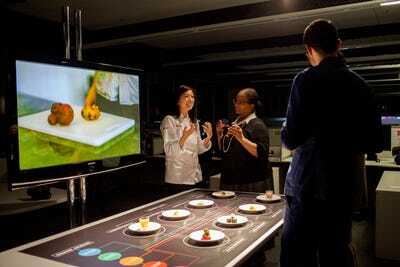 Lam worked with various partners at restaurants, farms, and cafes to find out what ingredients they thought they might have available ahead of the Arup party. She focused on ingredients that she knew would be in season, like carrots, tubers, squash, and root vegetables. While the ingredients often change from dinner to dinner, Lam creates menus using common strategies and techniques to save food and extend shelf life: pickling, toasting, and making soups or spreads. 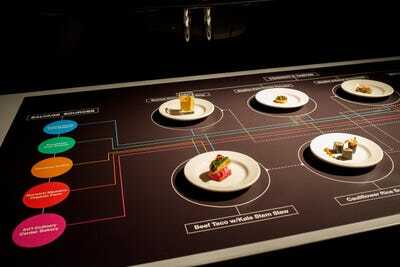 In the past, dinner menus were built 'Iron Chef-style,' says Lam. The team took whatever ingredients they were given, and found a way to use them. But they realised that wouldn't be possible for a 300-person event. So the pair partnered with Kalynn Dong (center) and her team at Toi et Moi Events. 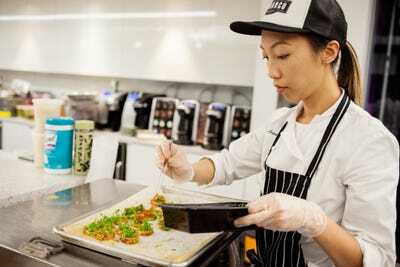 In addition to her catering company, Dong owns a chain of bibimbap kiosks in Manhattan that produce a large amount of usable food waste. The team used discarded beef cuts from the kiosks to make these beef tacos. The meat was braised in a coffee glaze made from spent coffee grounds from a nearby roaster. Lam simplified and modified some of her recipes to make prep easier for the large crowd. For smaller Salvage Suppers, Lam and Treuhaft often stop by farmers' markets near closing hours and ask what the farmers didn't sell. 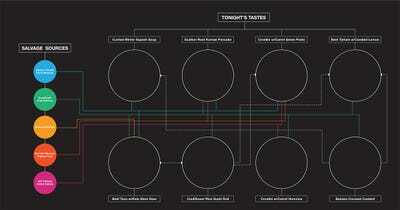 The scale of the Arup Party made this impossible. 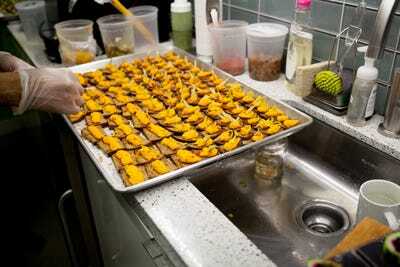 Instead, the duo had pick up the ingredients piecemeal over time and find ways to preserve them. This toasted crostini with spread is a popular dish at all of Salvage Supperclub's dinners. The crostini is made from stale, day-old bread from the International Culinary Center, which has been toasted. Lam creates carrot hummus from ageing carrots, which have lost their texture but maintain their flavour and nutritional value. The crostini are an example of Lam's 'root to stalk' philosophy. She uses the body of the carrot for the hummus, the carrot greens for a pesto, and the peelings in a separate sushi dish. The carrot hummus was delicious. For this banana coconut custard, the team used old, brown, or blemished bananas. While most people wouldn't touch them, old bananas actually make for great desserts, according to Lam, because they are sweeter and have a stronger banana flavour. Lam is also interested in educating the public about the potential of food they wouldn't normally think of eating. 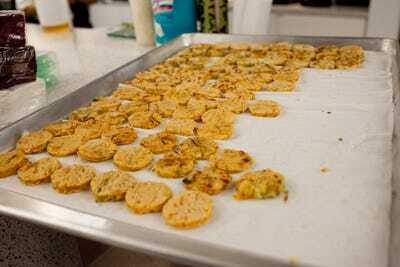 To make these scallion-root pancakes, Lam used chickweed, which many farms use for compost or livestock feed. Treuhaft and Lam got the beets for this beet tartare from a farm that wasn't going to harvest them because they were too small (and therefore too time-consuming to pull). The size had no effect on the taste, however. One guest told us that the dish was his favourite from the night. The beef tacos were definitely another crowd-pleaser, perhaps because they were the only meat dish. 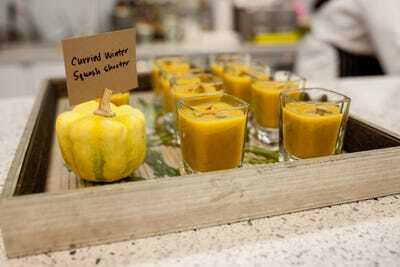 One guest complained, 'I'm more of an omnivore, so all the vegetable dishes are a bit disappointing. 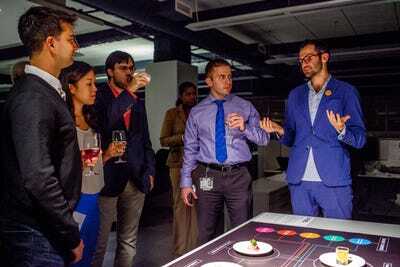 It does taste a lot fresher and healthier than the usual mozzarella sticks and mac n' cheese bites you get at company parties.' She then went in search of the server holding the tacos. Opinion on the food seemed to be split between those who enjoyed the healthy vegetable dishes and those who were disappointed to miss out on the greasy, filling hor d'oeuvres that they replaced. 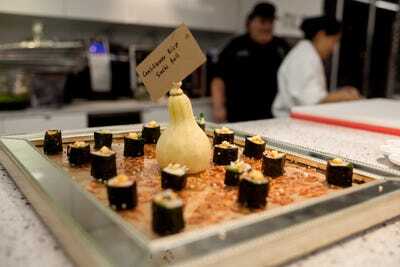 No one was spooked at all when they learned about the source of the appetizers' ingredients. We thought everything was delicious, though we won't disagree with the person hoping for more meat-based dishes. Food waste is a huge problem in America.